1. In a medium saucepan, combine the brown rice syrup, coconut oil, salt and wasabi. Sprinkle the agar flakes on top and gently stir. Heat over medium-low until the coconut oil melts and the mixture comes to a light boil. Simmer for about 30 seconds until the mixture begins to thicken slightly. Remove from heat. 2. 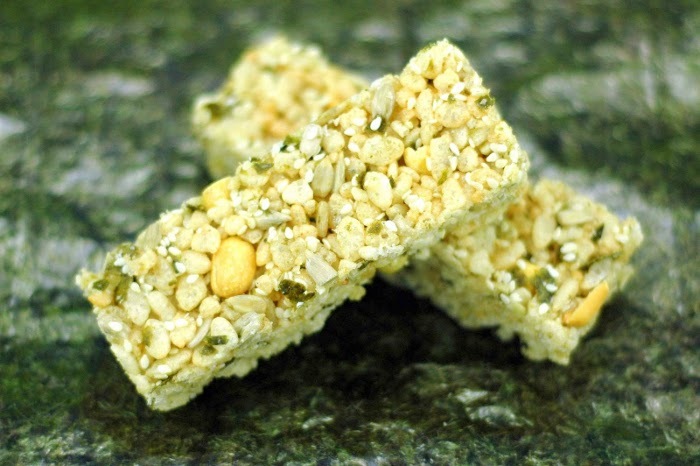 Add the brown rice cereal, peanuts, sunflower seeds, sesame seeds and nori. Stir until well combined, making sure the dry ingredients are well coated with the syrup mixture. 3. Spoon the mixture into a 8 x 8-inch square pan, pressing down gently and spreading it out evenly using the back of a spoon. Place the pan in the freezer for about one hour to firm up. Cut into bars using a sharp knife. Store in an air-tight container in the fridge or freezer. Nicole is a writer, editor, wife, and mother of two adorable rescue cats, Leola and Eli. She loves animals too much to eat them, and she's discovered that teaching others through food is a very effective vegan outreach tool. On her blog, A Dash of Compassion, Nicole aims to spread a positive message about healthy eating while celebrating all things sweet.